The average weight of the new Pilot 2-1 helmet is 1,418 grams and features a Helmet Construction with Thermoplastic shell and Micro-lock buckle retention system. 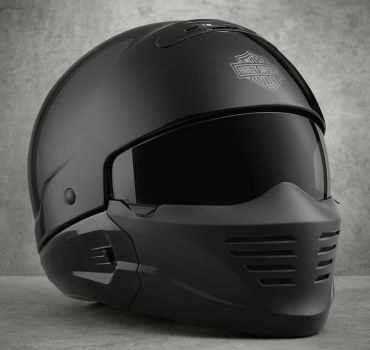 Stay cool with a front vent on top of helmet and breathing perforations on the face mask. Interiors & Linings feature Moisture-wicking, antimicrobial liners that are removable and washable. Ride-Enhancing Features include the unique 5/8 helmet that can be worn two ways for added comfort. For full comfort, add the optional face mask or to wear as a 5/8 helmet simply remove the face mask. The Pilot 2-1 includes a retractable sun shield with 95% UV protection and anti-fog coating on both sides. Stop by or order yours over the phone by contacting the Sunshine Coast Harley-Davidson team today on (07) 5357 8386.